Tru here. Leaving for travel again next month. One of the things i always dread is strange bathrooms. Sometimes cannot find flush mechanism. i know i have been shown many times, but if it does not have a handle sticking out somewhere, then my frustration has begun. Public restrooms often have sinks with faucet-type devices, but no way to know which is hot, cold, or soap … and no way to turn any of them on or off. Often have problems with my “starter” (or initiator) … so after confusion with faucet controls, dont know what i need to do first to wash my hands, and which is what and how to work ANY of the strange-looking things on the counter. Not unusual for me to just give up. Many strange bathrooms have no towels to dry your hands. i am expected to use contraptions with noise that makes ping-pong balls explode in my head. The harsh scary sound makes me want to run from the room in panic mode. 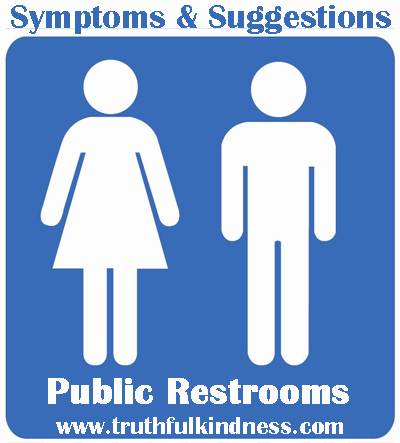 Large public bathrooms (such as airports) will often have three hallways; one is entrance/exit, one to stalls, and one to sinks. Problems with multiple hallways when i dont remember which i have already tried, so how to get out. On a bad day, same thing can happen in any restroom with multiple doors on the stalls (especially if stall doors are tall); cannot register which is a stall door and which is exit door, and do not remember which doors have already tried. In the confusion, i probably forgot to wash my hands (or gave up). On a good day i wont complain if you try to get me to wash my hands “again”, but it could make a bad day worse. So Afterward, it might be better if partner can offer “skin-softener” wipe (preferably cleanser mixed with moisturizer). * Admin issues: SHARE dementia awareness thru buttons below. Feel free to leave your thoughts in the form of comments, but please filter your comments with truthful loving kindness to all concerned. If interested in receiving notice of future blog postings, subscriptions are available through a “follow” button in the upper left corner (MS Explorer) or lower right (Safari, Mozilla Firefox and Chrome). If there is an advertisement below, I have no control over what is shown. My own full legal name is Truthful Loving Kindness. With the new terminology, my current diagnosis is still Mild Cognitive Impairment, but my neurologist said I am in a unique position for helping because I have “one foot in each door”. Text Copyright © 2018-03/12. Tags are: dementia, hygiene, PLwD, strategy, symptom, travel. This entry was posted in Dementia Symptom Tips, Important, Symptoms, travel and tagged dementia, hygiene, PLwD, strategy, symptom, travel. Bookmark the permalink. I feel your frustration and I donât have the level of confusion that you do. It would behoove designers and architects to consider the issues that the public with challenges have. I think the percentage of ânormalâ people â those without any challenges whatsoever, would be much less than those with challenges, and yet technology is designed for the norm not the challenged. This hi tech robotic era we are in is supposed to make things easier but so often it just causes frustration and anger. Simple solution to cleanliness at the end but Iâm sure it takes more than a cleaning wipe to overcome the episode just endured. I keep pocket hand sanitizer at the ready anyway. Just touching a shopping cart is an adventure in germ warfare. Take care Tru, always wonderful to read your post. and found her crying. The stalls were full and she couldn’t wait. Not knowing what do, just stood and waited.